If you look at the injuries at your worksite, you will probably find that knee injuries are one of the top 3 body areas injured each year. When you dig a little deeper, you may find that many of the reports of injury come from similar causes. Knee strains frequently occur when we lose control or balance when performing common tasks. Have you ever lost control as you were climbing stairs or off of motorized equipment? Slipping while climbing is an easy way to injure your knee or your back. When someone slips, this can put their knee into an awkward position, and the knee ligaments (hold the knee bones together) can become strained. If you ever watch soccer or NFL football, you are probably familiar with players that strain their knee when they lose control of their footing and land awkwardly. 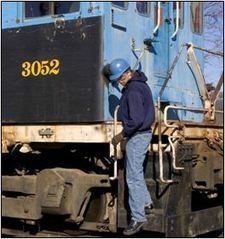 If you look in the picture, you will notice the worker using three points of contact as he descends the locomotive stairs. Three points of contact guarantees stability and reduces your risk of injury. Be on the lookout for the common factors for knee injuries: awkward positions of the knee (e.g. crouching, kneeling, twisting the knee), static postures (e.g. being in one position for a long period of time), high forces (e.g jumping from one level to the next or squatting/kneeling causing high force behind the knee) and our body weight.